No matter how hard they try, parents never have time to teach their children everything they need to know before they leave home. 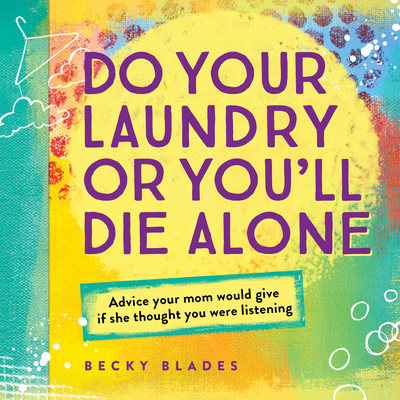 Luckily, Becky Blades has compiled the best tidbits of advice into one thought-provoking, conversation-starting book. Covering everything from posture to finances, with a hint of motherly sass, Do Your Laundry or You'll Die Alone is the perfect gift for leaving-the-nest kids, or anyone in your life who could use a little bit of coming-of-age common sense. Becky Blades is a writer, artist, business strategist, and philosopher of creative, adventurous living. Since selling her award-winning public relations firm, Blades has served on corporate boards, as a civic advocate for the arts and entrepreneurship, and as a consultant and mentor.A graduate of the University of Missouri School of Journalism, Blades speaks on topics including creativity, entrepreneurship, marketing, public relations, the French culture, and women's issues.Her blog, "stARTistry.com," celebrates the art of beginning. She has started 2,865 projects and finished 127. Among the unfinished are two almost-launched daughters, proving her point that it's not what you finish, it's what you stART.She lives in Kansas City with her husband of 30 years and her Maytag front load washing machine.